This book will help you save up to $5000 per year or more. 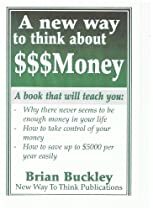 Brian Buckley has written A New Way to Think About $$$Money with one goal in mind. To help consumers take back control of their lives. Brian , with over 30 years experience in the financial world has identified why we never seem to have enough money in our lives. He teaches you how to first identify your financial weaknesses and then shows you how to develop action plans that will allow you to take back control of your money. All the free world is designed to get you to spend your money, this book will show you how this is being done so you can then make your own decisions on how to spend your hard earned cash. This book is for everone who wants a better life and the increased peace of mind wich comes from taking back control of your money.